The concept that the benefits of high economic growth will trickle down to lift the poor of the BRICS countries out of poverty has not worked, as the money making machine that is the foundation of economic relations is designed to funnel cash to the few rich rather than the mass of poor, Nobel Peace Prize winner , Muhammad Yunus, told The BRICS Post in an exclusive interview on the sidelines of the Seventh Astana Economic Forum in Kazakhstan. “There is a fundamental flaw in the system as it makes the pursuit of money the be-all and end-all. It makes money, not people, the centre of its value system. Money is inherently neither good nor bad, but it is the pursuit of money that can lead to corruption and moral compromises. Trickle down was supposed to work, but without the redistribution of income via taxes and social grants such as the Familia Bolsa in Brazil or the child support grants in South Africa, income inequality would be far worse. Those support programmes have a place, but they are mere palliatives. What we need is to create social businesses that provide jobs and income in a sustainable way,” he said. Yunus is a Bangladeshi social entrepreneur, banker, economist and civil society leader who was awarded the 2006 Nobel Peace Prize for founding the Grameen Bank and pioneering the concepts of microcredit and microfinance to those that traditional banks deemed not credit-worthy. The microloans are not intended to help families survive until the next payday, but rather to fund entrepreneurs who create businesses and thereby employment. Yunus was at pains to stress that these loans are not interest-free, a common misconception when the media writes about the Grameen Bank and its various international offshoots. “The whole idea is that the business has to be sustainable, so it needs to cover both its cost of capital and the cost of the staff and infrastructure. As a rule of thumb that means the cost of capital and a margin of ten per cent. In Bangladesh we charge 20 per cent. Grant money is appreciated as seed money, but in order to be sustainable and replicable, we need to be self-funding over time,” he said. The Norwegian Nobel Committee in its Peace Prize citation said that “lasting peace cannot be achieved unless large population groups find ways in which to break out of poverty”. Yunus said that people had to change their mindset from becoming job seekers to being job providers. “We have the capability within each of us to be entrepreneurs. We just need to change our consciousness to one of nurturing, rather than being shackled by the chains of conventional thinking. That is why I worry about social welfare systems that create a culture of dependency or entitlement. We have just started up a social business fund in Tunisia and have already received 2,300 ideas, which we are busy evaluating. We are in the process of establishing similar funds in other African countries such as Kenya and Uganda,” he said. 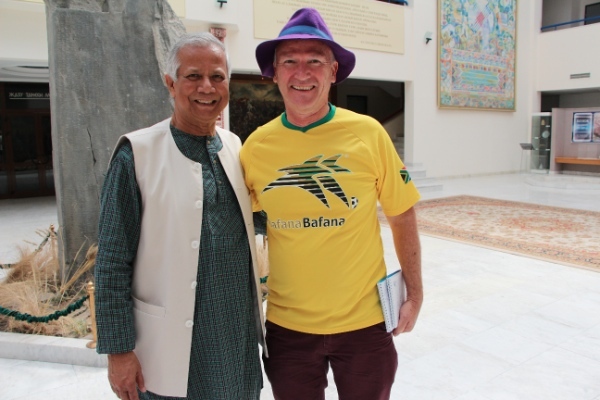 The Grameen Foundation provides institutional support for microcreditors, who want to replicate the success of the Grameen Bank in lifting the poor out of poverty, while the “Yunus Social Business initiative” creates and empowers social businesses to address and solve social problems around the world. “I started out as a banker to the unbanked, but I have now evolved into an incubator for businesses that solve problems. For instance in Bangladesh, half of the children were malnourished, in part because they did not get sufficient protein and micro-nutrients, so we entered into a joint venture with Danone, to create a company which distributes yoghurt enriched with micronutrients to the poor. This solves several problems at once. In the first place, it means that poor children receive the protein and micronutrients that their bodies require for bone and brain development. It also provides an income to the dairy farmers that supply the milk, as well as employment to the milk processors and yoghurt distributors. That is what I mean about creating companies to solve problems. That is an example that can easily be replicated around the world and for other products and services as well. We can grow the five examples into five million examples so that in the end you will have to go to a museum to discover what poor and unemployment meant , just as in most countries today we have to go special places to understand how smallpox, polio and rickets devastated people’s lives in previous generations, ” he concluded.